Bediüzzaman Said Nursi, was one of the most important thinkers of the Muslim world in the last century, who inspired a faith movement that has played a vital role in the revival of Islam in Turkey and now across the world. His magnum opus was the the “Risale-i Nur” collection, a body of Qur’anic exegesis attempting to reconcile the modern sciences and the Quran on the onslaught of a militant materialistic secularist atheism. 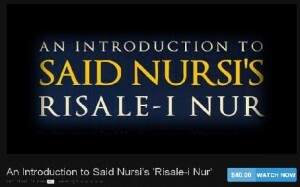 The recent rise of Turkey, can be attributed to the idea’s of Nursi. Dr Colin Turner is a leading expert on Said Nursi. He is a Reader in Islamic Thought in the School of Government and International Affairs at Durham University. He completed his BA (Hons.,First Class) in Oriental Studies (Arabic, Persian, Islamic Studies and anthropology), and then his PhD in Islamic Studies, from Durham University, and has been teaching at the university for the last 20 years. His research interests include: Muslim theology and philosophy; The history of Muslim political thought, The works of Bediuzzaman Said Nursi; Sufi spirituality; Shi’ism; The Qur’an and Qur’anic exegesis; Anthropology of religion and Persian literature. Turner, Colin & Horkuc, Hasan (2009). Makers of Islamic Civilisation: Said Nursi. Oxford: Oxford University Press. Turner, Colin P. (2005). Islam: The Basics. Oxford: Routledge. Turner, Colin (2004). The Koran (Critical Concepts in Islamic Studies). London: RoutledgeCurzon. Turner C (2000). The Muslim World. Turner C (1997). The Quran: A New Interpretation. Turner, Colin. (2008). 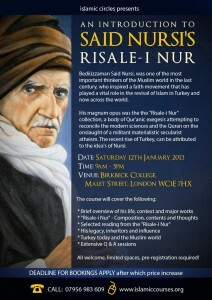 ‘The Six-Sided Vision of Said Nursi: Toward a Spiritual Architecture of the Risale-i-Nur’. In Spiritual Dimensions of Bediuzzaman Said Nursi’s Risale-i-Nur. Rabi, Ibrahim Abu Suny. Turner, Colin (2010). ‘Bediuzzaman and the Concept of ʿAdl: Towards a Nursian Ontology of Divine Justice’. Asian Journal of Social Science 38(4): 554-582. Turner, Colin (2007). ‘Reconsidering Jihad: the perspective of Bediuzzamen Said Nursi’. Nova Religio 11(2): 94-111. Turner, Colin (2006). ‘Wealth as an immortality symbol in the Qur’an: a reconsideration of the mal amwal verses’. Journal of Qur’anic Studies 8(2): 58-83. Besides teaching and supervising PHd students, he is a member of the Centre for the History of Political Thought and of the Institute of Medieval and Renaissance Studies at Durham University. “Reconsidering Islamic Pluralism in the Contemporary World.” Fountain April – June 2003. “Said Nursi on Interaction between Education and Ethics.” In Globalization, Ethics and Bediuzzaman Said Nursi’s Risale-I Nur. Istanbul: Sozler Nesriyat, 2002. “New Muslim Discourses on Pluralism in the Postmodern Age: Nursi on Religious Pluralism, and Tolerance.” American Journal of Islamic Social Sciences 19, no. 2 (Spring, 2002): 68-86. His most recent publication is “Said Nursi: Makers of Islamic Civilisation” by Oxford University Press, 2009. Dr Kerim Balci is a leading Turkish journalist with a specialism on the Middle East, speaking Hebrew, Arabic, and English. He has read Physics and Political Science and International Relations at Bosporus University for his BA and then an MA in Islamic and Middle Eastern Studies at the Rothberg International School of Jerusalem. Currently his PhD is focussing on a Bakhtinian reading of Said Nursi’s Epistles of Light. He has worked as a leading correspondent and Columnist for Today’s Zaman, Turkey’s largest circulating newspaper and has been an editor for various intellectual based publications such as Aksiyon Newsweekly and currently the Editor-in-Chief for the Turkish Review in Istanbul, a bimonthly journal published focusing primarily on Turkey and global socio-political issues.